This category has pieces from 1928, Monsoon, Argent Creations and more. NONE of the pieces in this category are antique; they are all reproduction pieces. 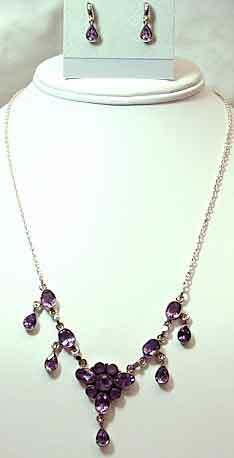 Description: Sterling Amethyst Dangle Drop Necklace and Co-ordinating Earrings - Beautiful genuine amethysts set in sterling silver. 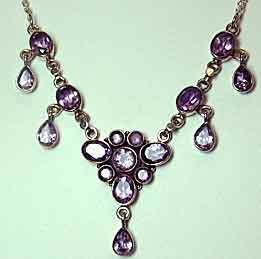 Necklace stone shapes are oval, teardrop and round; earrings have teardrop shapes echoing the dangling teardrops in the necklace. Necklace has adjustable lobster claw clasp and will fit up to an 18" neck (could easily be extended further). 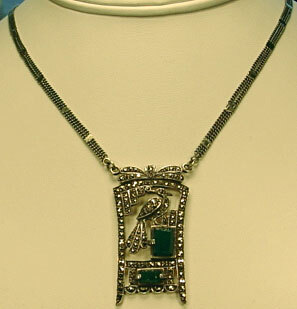 Center motif and dangle is approximately 1 1/4". Pierced earrings dangle about 3/4". 18.8 tgw. 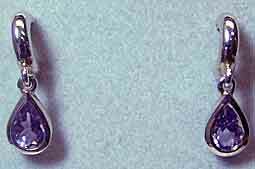 Description: Sterling Marcasite Amethyst Pierced Earrings - Beautiful genuine heart-shaped amethysts bezel set in sterling, accented with small round marcasites and a swirling cut out design. 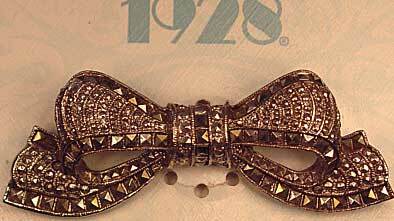 Pierced earrings are 7/8" x 5/8" with a slight doming toward the bottom to curve around the bottom of your earlobe. Extremely slight difference in amethyst color, as to be expected with genuine stones, that the naked eye does not pick up but that may be very slightly seen in the photo. 9.4tgw. 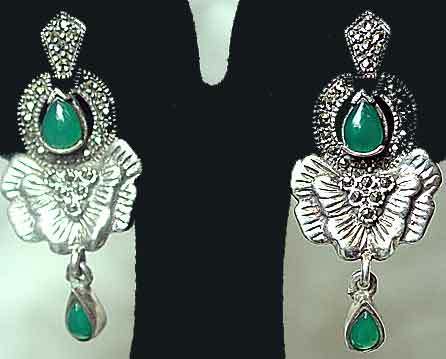 Description: Sterling Marcasite and Green Agate Dangle Earrings - Gorgeous earrings with a stylized floral motif are set with marcasites and genuine pear-shaped green agate. Earrings measure 1 3/4" x 3/4" ;post findings. 11.9 tgw. Description: Sterling Marcasite Set Heart Shaped Hoops - Who says that vintage look means it can't have modern comfort and style? 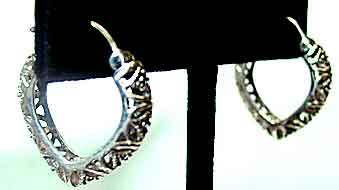 These sterling silver hoops use bead hand-set round marcasites running in a line down the center front of the filigree work - difficult to see in my second picture, but there. Pierced "harp" style findings. Earrings measure 7/8" x 5/8". 4.0 tgw. 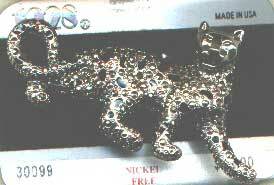 Description: 1928 Panther Pin Silvertone panther pin is 2.25" x 1.5" and has black enameled markings and genuine and faux marcasites. Done in the style of the Jeanne Touissant pieces for Cartier in the 1930s. 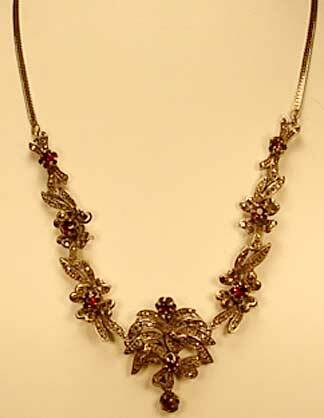 Description: Genuine Garnet, Sterling Silver and Marcasite Floral Themed Necklace - Done with oxidized sterling silver, this piece features 9 genuine garnets and innumberable marcasites, most of which appear to be bead hand set. 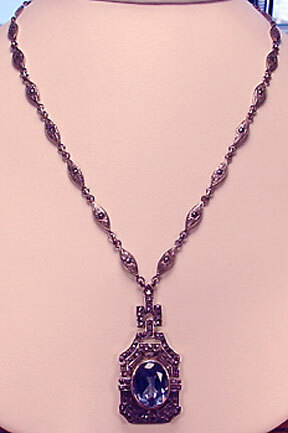 The chain is a flat herringbone; necklace has 7 links and total length measures 18" with about a 1" extension. All garnets are in a multi-prong setting. Description: Sterling Marcasite "Button" Pierced Earring - Square marcasites are set in a classic pattern in a diamond shaped earring. Post style findings. 7/16" in diameter. 3.4 tgw. Description: Large Synthetic Blue Topaz, Sterling Silver and Genuine Marcasite Necklace - Pendant style necklace with oxidized silver setting and bead hand-set marcasites. 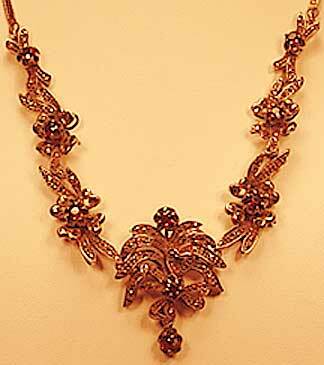 Fancy chain has marquise shaped links, each set with a paste set marcasite; chain measures 17" and is not adjustable. 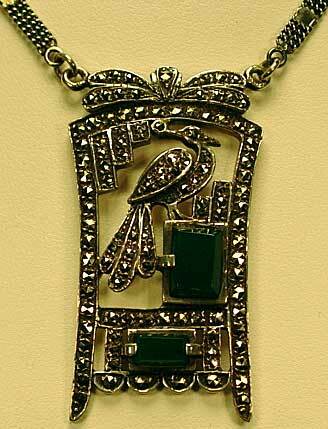 Jointed pendant measures 2" x 3/4" with a 12x16mm bezel set synthetic blue topaz stone. Description: Sterling Silver with Genuine Green Agate and Genuine Marcasite Necklace - Oxidized sterling with two rectangular green agate stones. Marcasites are bead hand set. Motif is a bird (peacock?) . Unusual double chain. Necklace is about 16.5 with 1" extension; hanging portion is about 2" x 1". 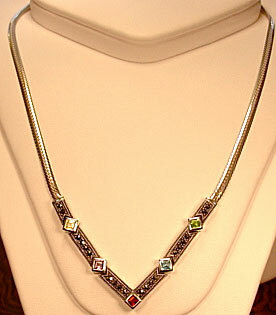 Description: Sterling V Necklace with Synthetic Stones - A more contemporary looking piece with square synthetic stones in citrine, amethyst, garnet, blue topaz and peridot, in an oxidized setting with hand-set marcasites. Chain is NOT oxidized and does not have an extension. At 15"-15.5" length, this would be considered a choker. Center v is jointed at stones (except for the stone at the point of the v) and is 1/8" wide.